Woman’s Own columnist Richard Arnold has been tweeting up a storm behind the scenes at Strictly Come Dancing. He’s getting on like a house on fire with the other boys, as you can see, so no rivalry as yet. We went to see the launch show last night, which you will see on Saturday, and it was f-a-b-u-l-o-u-s! 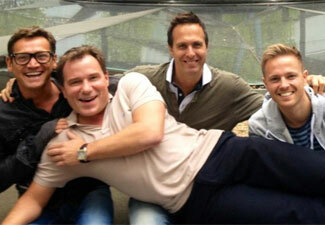 You can follow Richard on Twitter @richardaarnold. Strictly Come Dancing starts on Saturday on BBC1 at 6.30pm. View the full celebrity line-up in our gallery.